Sandwiches are basically the perfect food. They're versatile, portable, and you can get all the food groups in a single bite. What more could you want? Leaving out the much-contested barbecue sandwich (read about those here), here are the 12 places to get a great sandwich in Memphis. Fino's is where the established locals go for an authentic Italian deli experience because it's filling, tasty, and cheap. 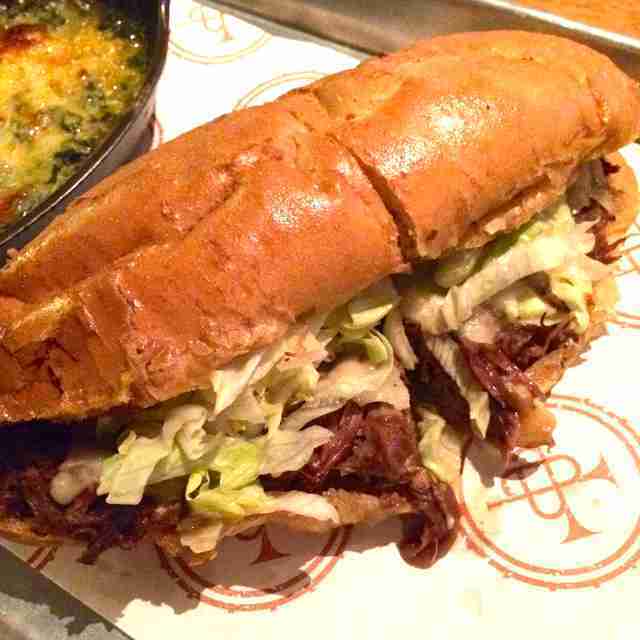 The daily plate specials are incomparable, but it's the sandwiches that keep Midtowners coming back. The Fino is perfect in its simplicity: salami, Provel, and homemade black olive dressing on crusty, crisp baguette. This funky coffee and gourmet sandwich shop is a hotspot for downtowners looking for a bite (or three) to eat while getting some work done. The Stanley is one of several satisfying sammies on the menu, but it stands out due to the soft, grilled brioche, turkey, candied bacon, artichoke aioli, tang from pickled red onion, and spice from the arugula. Kwik Chek Korean deli and market can meet all your bibimbap and kimchi needs, but it's also known for gyros, falafel, and most of all, big, delicious sandwiches. 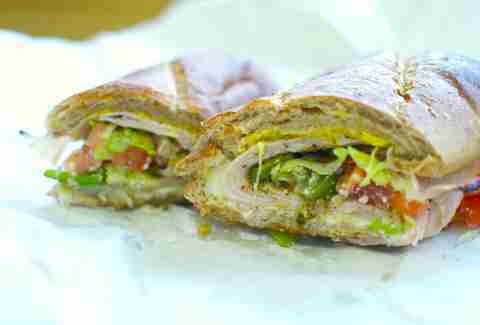 The Turk gets you provolone and turkey piled high with veggies on a hoagie, with Parmesan cheese and lemon herb dressing. What do you get when you cross an Italian-inspired craft butcher shop with a place that bakes insanely good breads and pastries? 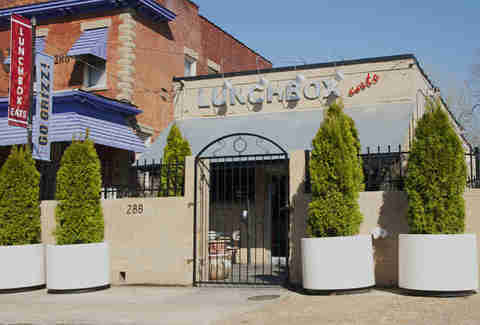 An amazing sandwich shop, of course. What makes Porcellino's turkey croissant so good is the precisely flaky, buttery croissant, a thick pile of high-quality turkey, arugula, and homemade mayo. 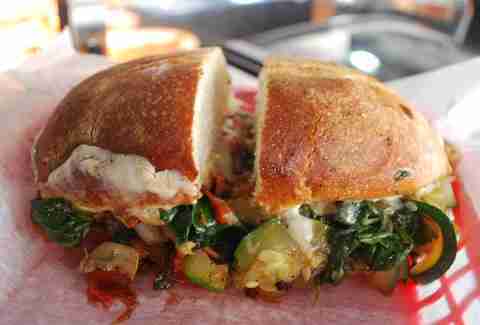 Great news: you can also enjoy Porcellino's sandwiches at Broad Avenue coffee shop City & State. You'll have to pick it up with two hands. The bread is toasted, but soggy in places, the meat is juicy (read: dripping), the lettuce is shredded, and the mayo is tangy. Sounds like an absolutely perfect New Orleans-style roast beef po-boy, available at the appropriately named Second Line in Midtown. 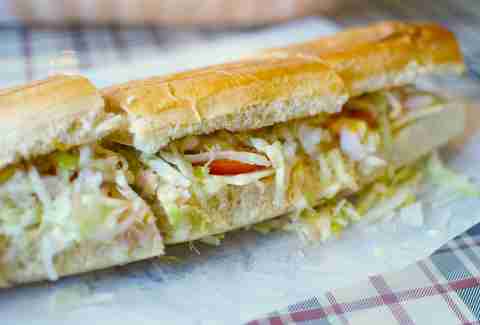 There are plenty of fried seafood po-boy options, but something about that tender beef and perfectly baked bread makes the roast beef particularly irresistible. The first time you try Lunchbox Eats' Holiday Break chicken salad sandwich, you're going to ask yourself: why don't we put more sandwiches on cornbread?! Really, it's such a fantastic idea and the buttery cornbread goes so perfectly with the tangy, lightly sweet chicken salad and slice of house-made pickle that it's hard to comprehend why cornbread sandwiches aren't more of a thing. For another creative bread replacement, go for the fried chicken and cheddar waffle sandwich. It's a debate that Memphis will have for eternity: hard bread or soft bread? Whichever you decide, the sandwiches at the cash-only Chinese Sub Shop (no one calls it by its real name) are phenomenal. With the Super Sub, you're getting the lightly sweet homemade bread with ham, turkey, salami, bologna -- and yes, something called "lunchmeat" -- dressed with everything including that tasty Italian-style dressing. Just don't forget your free bag of chips. 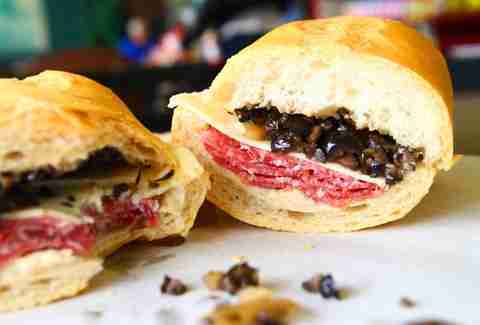 Yes, you'll need to go a little ways out of Memphis proper to enjoy the Italian deli stylings of Vanelli's sandwiches, but it's worth it for the Ami and uber-friendly, familiar atmosphere. 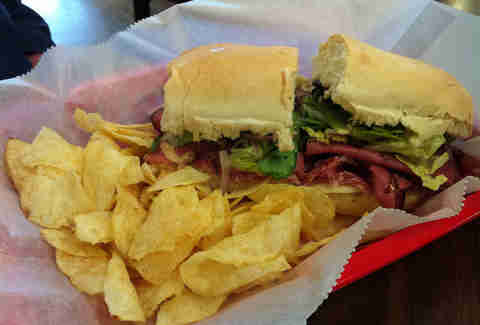 On the Ami, you'll get pastrami, two kinds of salami, provolone, peppers and onions, plus lettuce, tomato, and Vanelli's special recipe Italian dressing. Turn it up at "the Deli" in Cooper-Young with the Heat Miser, a hoagie-based sandwich filled with hot sauce-soaked smoked turkey, plus jalapeños, peppers, pepper Jack cheese, and just in case you like pain: hot mustard. Don't make the mistake of not ordering a side of fries -- regular or sweet potato, they're some of the best in town. 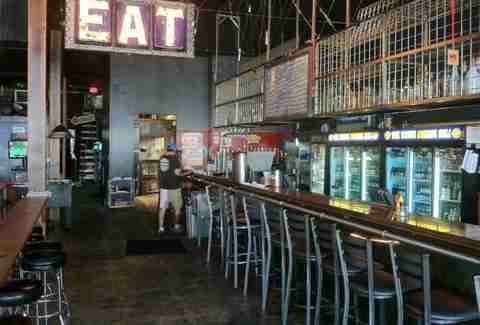 Then cool down with a beer from the humongous draft selection or a sit on the popular patio. Aldo's is known as a pizza powerhouse, but the new Midtown location has a couple of paninis that easily earn a spot on this list. 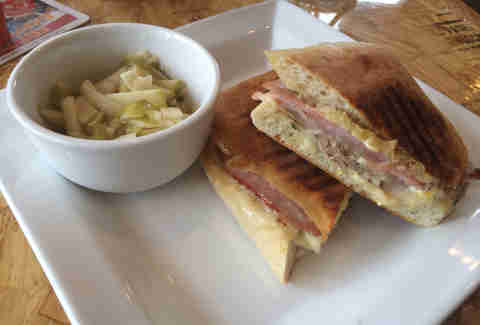 The Cubano comes with slices of ham, pulled pork from Central BBQ, provolone, dill pickles, something with a little kick called "mojo" aioli, all pressed and heated inside a ciabatta bun. If you're feeling a little adventurous, get even more flavors with a side of the apple celery slaw. Trolley Stop’s Slammin Veggie Hoagie proves that you don’t need bacon or piles of “lunchmeat” (of any kind) to have a successful sandwich. First, they take their fresh homemade hoagie and toast it; then, they grill farm-fresh tomatoes, onions, zucchini, spinach, and mushrooms and put it on the bun. Next, the farm-to-table experts at Trolley Stop load the sandwich with provolone, top it with avocado, and deliver it to your table (or your door) so you can taste for yourself that veggies don’t have to be boring. 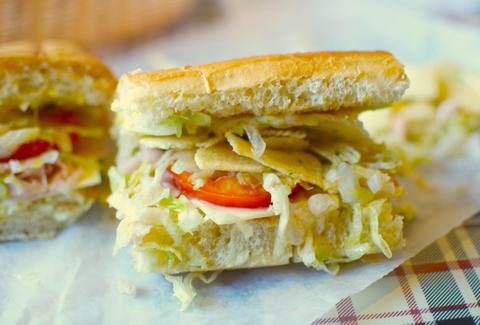 When it comes to Memphis sandwich stalwarts, Bogie’s is top of the list. Its Turkey Deluxe is the most popular sandwich, with fresh, premium smoked turkey, provolone, mayo, lettuce, and chopped tomatoes on a French roll with secret recipe dressing. It's almost like a salad on a roll, if the salad was hearty, filling, and extra tasty.